I wonder how many students who attend J. Percy Page High School actually know who their school’s namesake was. Before he had a school named after him, before he worked as a high school principal, and way before he served as the eighth Lieutenant Governor of Alberta, Mr. Page coached perhaps the most winningest team in the history of North American sports! The Edmonton Grads basketball team, with coach J. Percy Page. Actually, the Edmonton Grads - out of the then new McDougall High School - still hold the record for the best winning percentage of all time (96.2%), for any team in any sport! Between 1915 and 1940, the all-female basketball team lost just 20 times, and won 502 of their matches, even sweeping four consecutive Olympic Games (1924-36) and pummeling their opponents 1,863 to 297, overall. 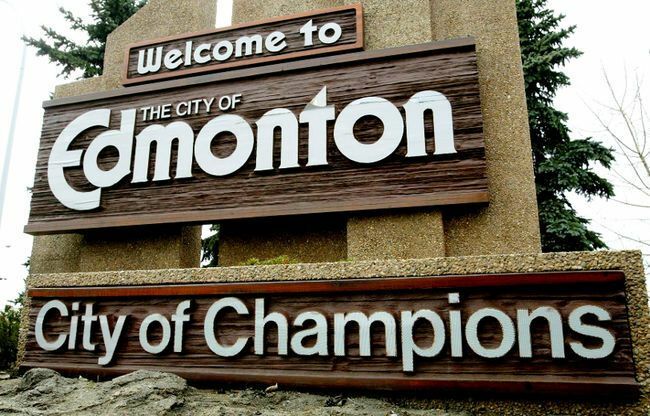 So, before the Eskimos, before the Oilers, and way before the Oil Kings, the Grads warranted our “City of Champions” epithet. More importantly, these young women were from Edmonton, not traded here. They grew up here, went to school here, and perhaps raised their own families here, too. They were amongst the very first true local champions that others idolized and looked up to. But, not the last. There’s a proud history of great athletes born and/or raised in the Edmonton area, including NHL stars like Mark Messier, Jarome Iginla, Joffrey Lupul, and Grant Fuhr, Olympians like Pierre Lueders, Jennifer Heil, David Bissett, and Edi Podivinsky, or Hall of Famers like Randy Ferbey (curling), Gary Beck (drag racing), Neil Colville (hockey), and Mildred Warwick (baseball). In 1922, the Edmonton Grads women’s basketball team won their first Canadian title, eventually holding the North American record for the sports team with the best winning percentage, with 502 wins from 1915 to 1940 (96.2%)! In 1923, the Edmonton Eskimos ice hockey team won the Western Canada Hockey League championship. That same season, they also made the Stanley Cup Finals. In 1933, Cliff Manahan’s Edmonton team won the Brier, the Canadian men’s curling title. His team won their second title in 1937. 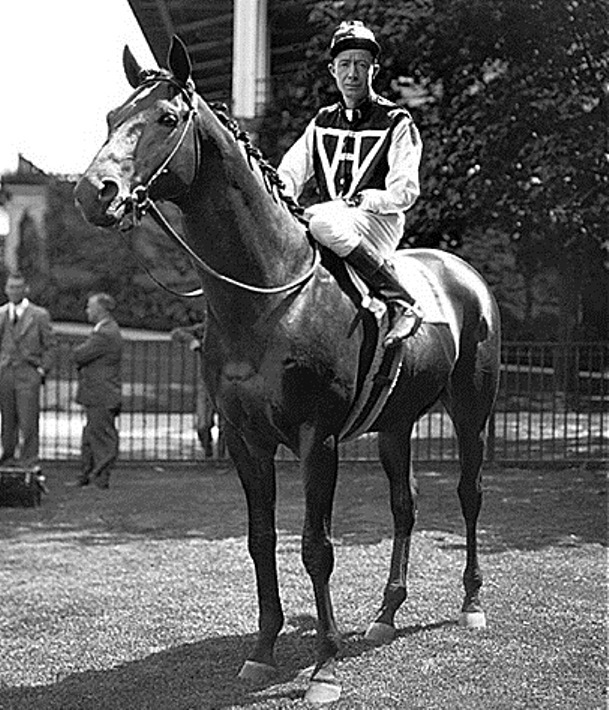 In 1933, Edmonton-born John “Red” Pollard won his first two major horse races (of 16 total), the Prince of Wales Stakes and the King Edward Gold Cup. He later rode the legendary Seabiscuit from 1936 until 1938. 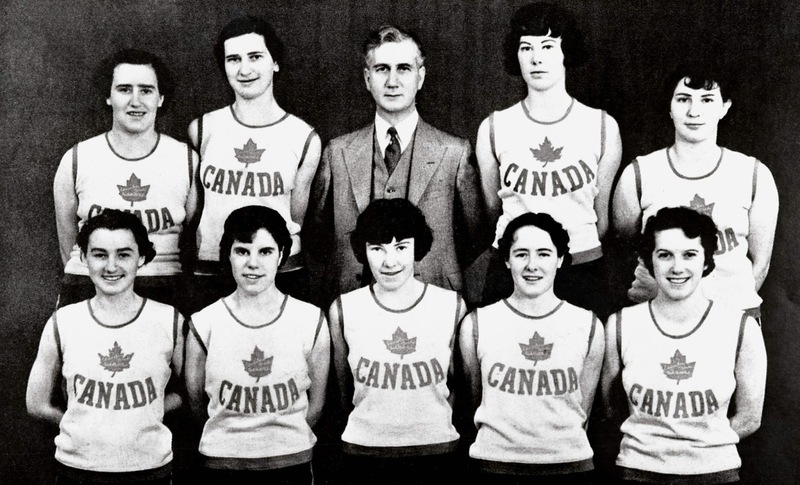 In 1938, Noel MacDonald, captain of the record-breaking Edmonton Grads basketball team, was named Canada’s outstanding woman athlete of the year. In 1947, Edmonton’s Doreen McLeod Ryan won the national junior speed skating championship for women, the intermediate title in 1949, and then the senior title in 1951. In 1950, the Edmonton Mercurys won the World Ice Hockey Championships, and then the gold medal at the 1952 Winter Olympics in Oslo, Norway. In 1953, Edmonton golfer Henry Martell won the Canadian PGA Championship. He won a second time in 1958, in addition to the Dominion Amateur Golf Championship of 1946. In 1954, hometown favourite Matt Baldwin led his team to the Brier championship in Edmonton. They won again in 1957 and 1958. 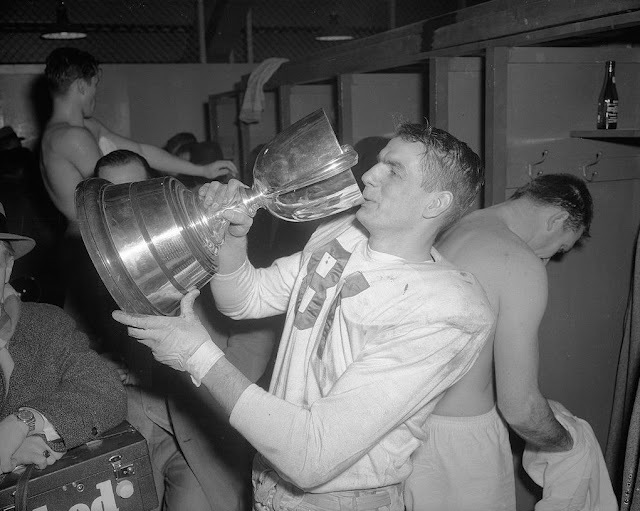 In 1954, the Edmonton Eskimos won their first of 13 Grey Cups, defeating the Montreal Alouettes 26-25. They won again in 1955-56, 1975, 1978-82, 1987, 1993, 2003, 2005, and most recently in 2015. Don Getty of the Edmonton Eskimos, in 1956. In 1960, “the Swimming Smiths” (George, Susan, Sandra, Graham, Rebecca, Lewis, Allison, & Scott) began winning their combined 13 gold, 12 silver, and eight bronze medals! In 1961, Edmonton’s Hec Gervais (born in St. Albert) and his team won the Brier. He won the world championship that very same year. In 1962, the Edmonton Huskies won the Canadian Junior Football Championship, and then again in 1963, 1964, 2004, and 2005. In 1963, the Edmonton Oil Kings beat the Niagara Falls Flyers to win the Memorial Cup Championship. They won it again in 1966. In 1964, the University of Alberta Golden Bears won their first of 15 Canadian inter-university ice hockey championships (also in 1968, 1975, 1978-80, 1986, 1992, 1999, 2000, 2005-06, 2008, 2014-15). In 1967, the Edmonton Wildcats were named the Canadian Junior Football champions, an honour they captured again in 1977 and 1983. In 1967, the University of Alberta Golden Bears won the Canadian inter-university football championship, and again in 1972 & 1980. In 1970, the University of Alberta Golden Bears won their first Canadian inter-university wrestling championship. They won again in 1971, 1972, and 2013. In 1972, the University of Alberta Golden Bears won their first Canadian inter-university soccer championship, and won again in 1979, 2003, and 2006. 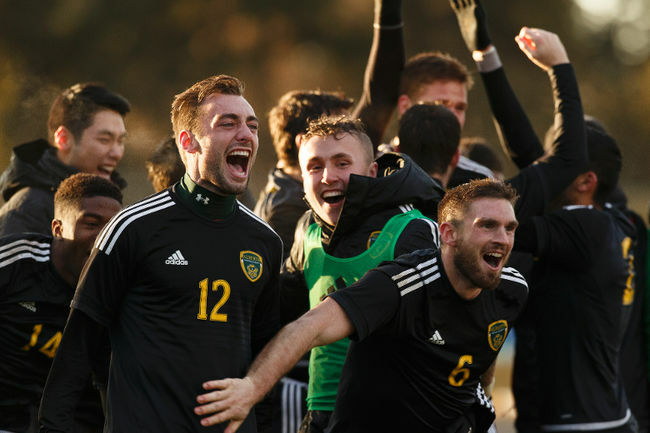 The University of Alberta Golden Bears soccer team, winning the Canada West Final Four gold medal in 2016. In 1974, Edmonton-based Susan Nattrass won her first of six consecutive World Championships in women’s trapshooting. In 1974, Edmonton trap shooter John Primrose won gold at the Commonwealth Games, followed by gold at the 1975 Trap World Championships, and at the Commonwealth Games of 1978. In 1976, Edmonton was represented at the Summer Olympics by swimmers Cheryl Gibson, Graham Smith (both silver), and Becky Smith (bronze). In 1978, Graham Smith became the first person to win six gold medals at a single Commonwealth Games, and he did it in his hometown Edmonton! Sister Becky also won two medals (one bronze, one silver). In 1980, the University of Alberta Golden Bears won the Canadian inter-university men’s cross-country skiing championship. In 1981, the Edmonton Drillers beat the Chicago Sting 5-4 to win the North American Indoor Soccer League championship. In 1981, the University of Alberta Golden Bears won their first of eight Canadian inter-university volleyball championships (also won in 1997, 2002, 2005, 2008-09, & 2014-15). In 1983, the NAIT Ooks won their first Canadian Collegiate Athletic Association National Championship in women's curling, which they took again in 1988. 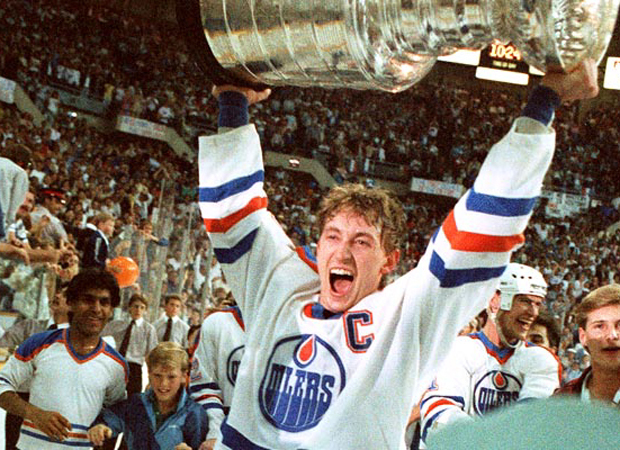 In 1984, the Edmonton Oilers won their first of five Stanley Cup championships! They won the Cup again in 1985, 1987, 1988, and 1990. Wayne Gretzky of the Edmonton Oilers, in 1985. In 1984, the Edmonton Trappers became the first Canadian team to win the Triple A PCL championship, and then won again in 1996, 1997, and 2002. In 1986, Edmonton’s Gail Greenough became the youngest, the first woman, and the first North American to win the World Show Jumping Championships (with zero faults!). In 1987, Edmonton-born Art Boileau came in first at the Los Angeles Marathon (2:13:08). He did so again in 1989 (2:13:01), and placed second at the 1986 Boston Marathon (2:11:15). In 1987, the NAIT Ooks' men's soccer team won the National Championship of the CCAA (Canadian Collegiate Athletic Association). They won again in 2011. In 1988, Edmonton’s Pat Ryan led his team (with Randy Ferbey) to the Brier men’s curling championship. They won again in ‘89. In 1989, Edmonton-based Kurt Browning won his first World Figure Skating Championship, and then won again in 1990, 1991, and 1993 (2nd place in 1992). 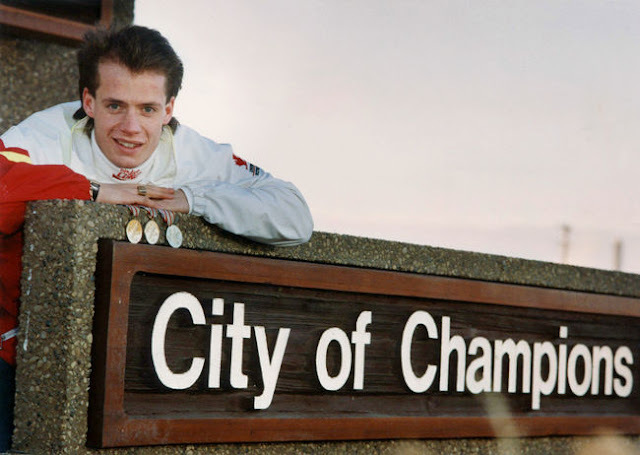 Ice skater Kurt Browning at the old "City of Champions" sign. In 1989, the NAIT Ooks took home the Canadian Collegiate Athletic Association's National Championship in men's basketball, capturing the title again in 2003 and 2016. In 1990, Edmonton’s Lisa Sargeant won the Canadian Figure Skating Championships (women’s). She placed second in 1991. In 1991, Edmonton’s Kevin Martin led his team to the Brier men’s curling championship, winning again in 1997, 2008, and 2009. In 1992, Edmonton-born Michael Slipchuk won the Canadian Figure Skating Championships (men’s). In 1993, the NAIT Ooks won their first of five Canadian Collegiate Athletic Association National Championships in mixed doubles badminton, winning again in 2000, 2009, 2013, and 2016. In 1994, the University of Alberta Golden Bears won the Canadian inter-university basketball championship, and again in ‘95 & ‘02. In 1994, Edmonton skier Edi Podivinsky won his first World Cup victory in downhill skiing. That same year, he won a bronze metal at the Winter Olympics. In 1994, Edmonton bobsledder Pierre Lueders won his first of 11 World Cup Championships, including the two-man title again in 1995, 1997, 1998, 2003, and 2006. In 1994, the Victoria School of the Arts’ cheerleading team won the Suzutan World Cheerleading Championships, their first of more than 200 future championships. 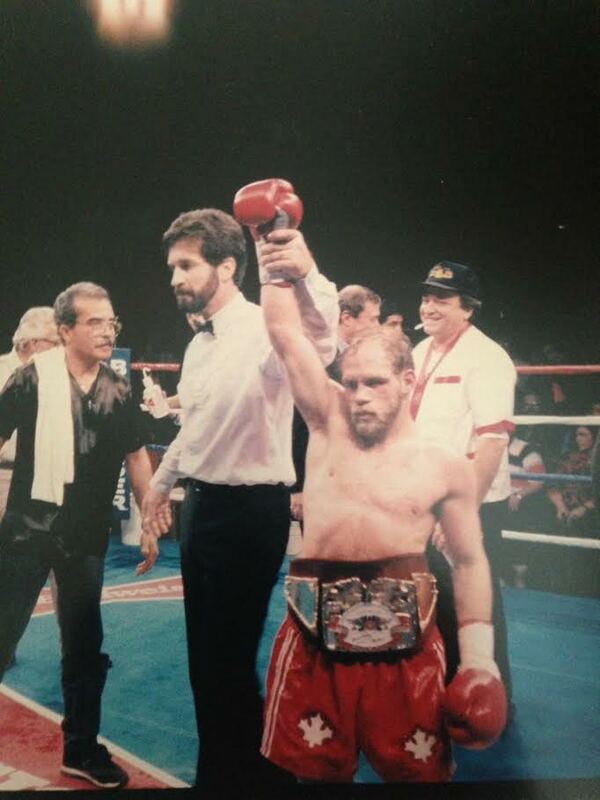 In 1995, Edmonton’s Scotty “Bulldog” Olson won his first International Boxing Organization world title (flyweight). He also won a gold medal at the 1986 Commonwealth Games. Championship boxer Scotty "Bulldog" Olson. In 1995, the University of Alberta Pandas won the CIS Women’s Volleyball Championships for the first of six consecutive years (until 2000). They won again in 2007. In 1997, IBM’s Deep Blue chess-playing computer defeated Garry Kasparov and became the first computer to defeat a reigning world chess champ. It was co-developed by former Edmontonian Murray Campbell. 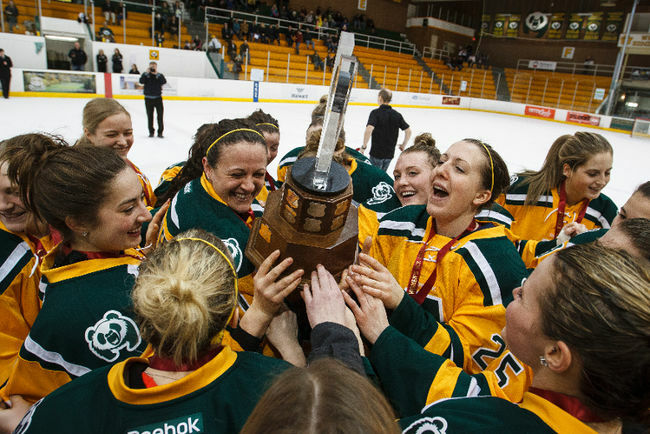 In 2000, the University of Alberta Pandas won their first of seven Canadian inter-university hockey championships, capturing the title again in 2002-04, 2006-07, and 2010. The University of Alberta Pandas ice hockey team celebrate their 2015 Canada West Championships win. In 2001, Edmonton-based Jamie Salé and David Pelletier won gold in the World Figure Skating Championships. They famously won gold at the Winter Olympics the following year, following much controversy. In 2001, the University of Alberta Golden Bears won the Canadian university championship for track and field. In 2001, Edmonton-born Randy Ferbey led his team to the Brier men’s curling championship, which they would win again in 2002, 2003, and 2005. In 2002, the NAIT Ooks' men's doubles badminton team won the National Championship of the Canadian Collegiate Athletic Association, then again in 2015. 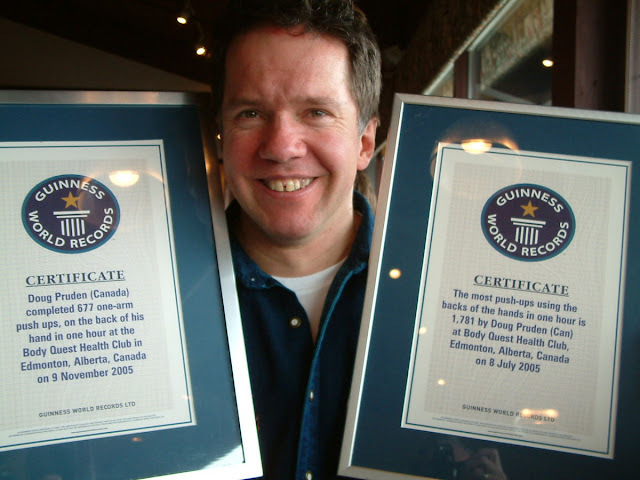 In 2003, Edmonton’s Doug Pruden set his first of many national & world push up records, doing 114 one arm push ups in one minute. Push up champ Doug Pruden showing off some of his world records. In 2008, the NAIT Ooks took the CCAA National Championship title in men's singles badminton, which they would take again in 2009, 2011, 2012, 2013, and 2014. In 2008, the NAIT Ooks' women's singles badminton team captured the Canadian Collegiate Athletic Association National Championship. They won again in 2014. In 2010, Edmonton’s Jessica Gregg won a silver medal at the Winter Olympics in the 3,000-meter relay. Her father is five-time Stanley Cup winner and former Oiler Randy Gregg. In 2010, Shannon Szabados of Edmonton won a gold medal at the Winter Olympics as goalie for Canada’s Women’s Hockey Team! Together, they won gold again in 2014. In 2011, the Edmonton Oil Kings won the Western Hockey League championship. They won again in 2014, as well as that year’s Memorial Cup. In 2011, the Edmonton Capitals baseball team won the inaugural North American League championship, also their final season in the league. In 2012, the University of Alberta Golden Bears won the Canadian inter-university curling championship, and then won it again in 2015. In 2012, the NAIT Ooks were named National Champions in women's doubles badminton by the CCAA, winning again in 2014 and 2016. In 2013, the NAIT Ooks' men's curling team won the Canadian Collegiate Athletic Association's National Championship. In 2015, the Edmonton Rush won the National Lacrosse League’s Champion’s Cup, beating the Toronto Rock. The Rush relocated to Saskatoon for the 2016 season. In 2016, Edmonton-raised Jen Kish won a bronze medal at the Rio Summer Olympics in women’s rugby sevens, as captain. 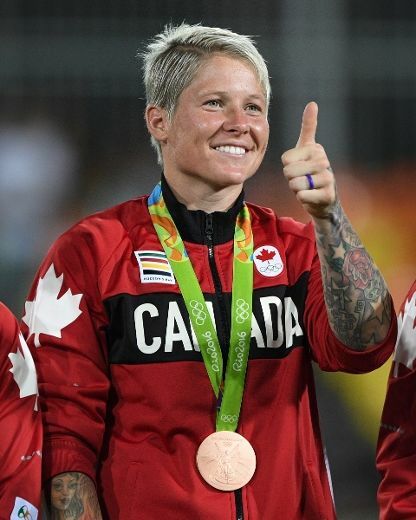 Rugby team captain Jen Kish with her Bronze medal from the 2016 Rio Summer Olympics. In 2016, Edmonton cyclist Ross Wilson won two silver medals in individual pursuits at the 2016 Rio Paralympics. Did we miss any? Let me know!